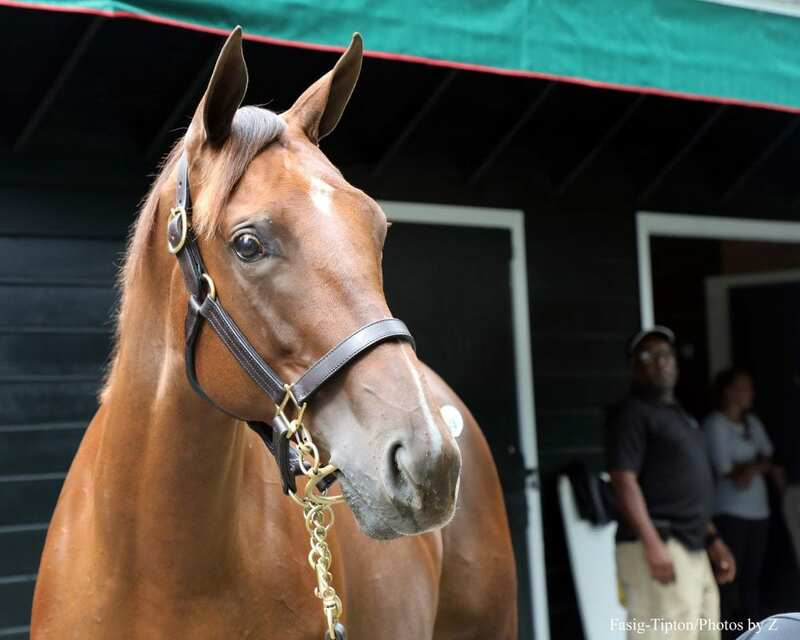 The first session of the Fasig-Tipton Saratoga Selected Yearlings sale on Monday was a banner night for both American Pharoah offspring and lucky garments. Moments after Hip 26, a filly from the first crop of the Triple Crown winner, sold for $1.2 million, Brian Graves of consignor Gainesway was asked his secret for finding and placing the right horses for the Saratoga marketplace after buying them as weanlings. He reached into his back pocket and provided the answer with a blue and white piece of cloth. “It's my dad's lucky handkerchief,” he said. The Saratoga sale was the last catalog put together with the efforts of his father, the late Fasig-Tipton vice president Bill Graves, who died in May. 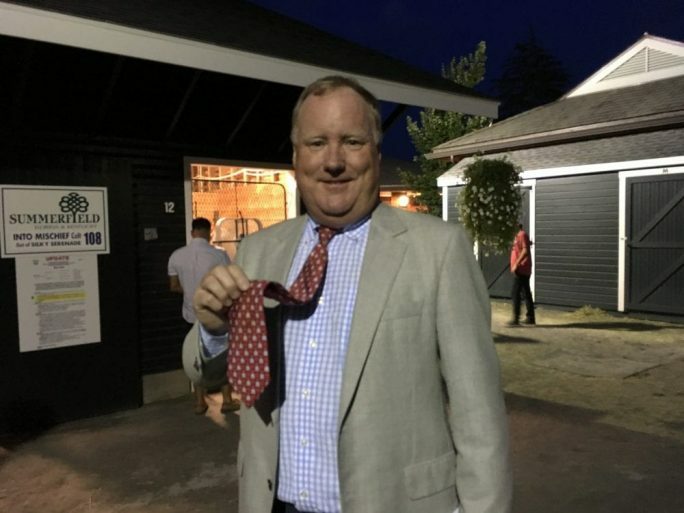 It was a fitting final act for the elder Graves at a sale where his presence was felt consistently through a tribute in the catalog, a speech by announcer Terence Collier prior to the first offering, and a commemorative tie for sale benefiting the Thoroughbred Aftercare Alliance. A few hours later, Jerry Nielsen, son of breeder Joanne Nielsen, clutched his own lucky tie as their American Pharoah colt, Hip 62, left the ring for $1 million. The red necktie belonged to his father, Gerald Nielsen, who died in 2004. Whatever good fortune was generated from the lucky charms came through with gains in gross and average sale price, with a steady median. Monday's session saw 83 horses sold for revenues of $28,965,000, up 19 percent from last year's opener when 75 horses brought $24,425,000. The average sale price rose 7 percent to $348,976, while the median went unchanged at $300,000. The buyback rate finished at 22 percent compared with 18 percent last year. “It was a very encouraging start to the sale tonight,” said Fasig-Tipton president Boyd Browning. “We thought we had good horses, and I think the buyers responded very favorably across the board. Larry Best's OXO Equine secured the session-topping American Pharoah filly, out of the Grade 1-winning Malibu Moon mare Life at Ten. The dam's three foals to race are all winners, including G2-placed Singing Bullet. The Ontario-bred session-topper is from the family of champion Rubiano, G1 winner and top commercial sire Tapit, and notable sires Relaunch and Glitterman. The filly was a $500,000 weanling purchase at last year's Keeneland November breeding stock sale by Blue Sky Stables, led by Brian Graves, Gainesway's director of public sales. Other partners in the filly included McMahon & Hill Bloodstock and Bonne Chance Farm. Graves said having those partners allowed him to set a higher price ceiling to land the filly as a weanling. This is the second consecutive Saratoga sale in which Graves has pinhooked a weanling into a seven-figure transaction as a yearling. Trainer Bob Baffert signed the ticket for the next seven-figure American Pharoah yearling, on behalf of M.V. Magnier of the Coolmore partnership. American Pharoah was trained by Baffert during his on-track days, and he stands at Coolmore's Ashford Stud in Versailles, Ky. The New York-bred colt is out of the unraced Touch Gold mare Party Silks, whose three foals to race are all winners, including G2 winner Upstart and stakes-placed New York Hero. The extended family features G2 winner Josh's Madelyn. Summerfield Sales consigned the colt as agent for the Nielsen family's Sunnyfield Farm in Bedford, N.Y.
Jerry Nielsen of Sunnyfield Farm shows off his lucky tie, belonging to his late father, after an American Pharoah colt bred by his family's operation sold for $1 million on Monday night at the Fasig-Tipton Saratoga Selected Yearling Sale. The market continued to show heavy interest in foals by American Pharoah, which began with a trio of seven-figure horses in the U.S. and Japan during the weanling and short yearling portions of the last mixed sale season. American Pharoah had six yearlings sell on Monday for a combined $3.22 million and an average of $536,667. In the days leading up to the sale, Vanlangendonck said the novelty of seeing a yearling by the Triple Crown winner helped drive foot traffic around his shedrow, which he leaned into as a marketing tool for the horse. Read the Paulick Report's complete sale preview here. The view the sale catalogue, click here. To view results, click here. To watch the sale live, click here. This entry was posted in Bloodstock, NL Article and tagged 2018 saratoga, american pharoah, Bob Baffert, Brian Graves, coolmore, fasig-tipton, francis vanlangendonck, gainesway, Jerry Nielsen, larry best, Life At Ten, m.v. magnier, oxo equine, saratoga selected yearling sale, summerfield sales, Sunnyfield Farm by Joe Nevills. Bookmark the permalink.